Resistance is futile. 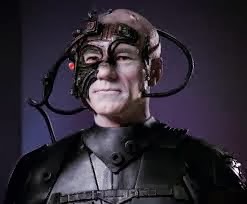 So the Borg has spoken. Nothing new here, but an interesting perspective on the Arizona "anti-gay" bill, now that it has been properly vetoed and laid to rest with a stake in its heart, along with all other such bigoted discrimination. We know it was only calculated to promote the posting of still more of those pernicious "NO GAYS ALLOWED" signs that we see in Arizona businesses all over the state. Because most of the media coverage told us so. The article makes a good case for characterizing public perception, especially as it is so strongly steered by the media today. A headline in the NY Times is worth far more toward coloring public sentiment than all the apologetic posts that were ever written. In fact, the Arizona bill was similar to legislation that is proposed or already enacted in several other states. It basically repackaged the ideas embodied in the federal Religious Freedom Restoration Act and made them applicable to the State of Arizona. 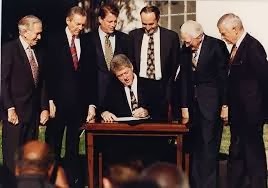 Remarkably, the original RFRA was sponsored by Chuck Schumer, was nearly unanimously approved in the Congress, and was signed by President Clinton in 1993. 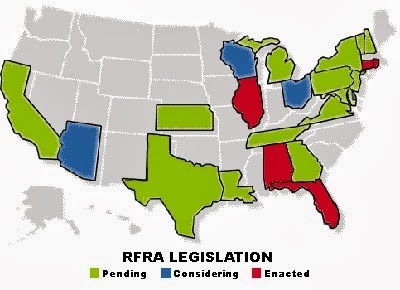 So, is the federal legislation also "anti-gay"? 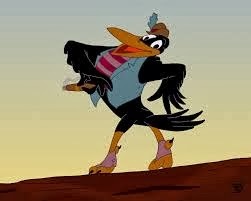 Could it be an example of federally-based "Jim Crow"? In her speech justifying the veto, Governor Brewer asserted that not one example of religious discrimination has been found. But most ironically, it also seems telling that not one "NO GAYS ALLOWED" sign has been found in any Arizona businesses either.